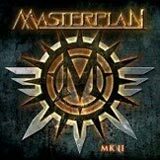 Masterplan's third album MK II is here and I was curious to see how it would fare, knowing that Jorn Lande was no longer the lead singer for the band. His voice and vocal abilities were quite a part of the Masterplan overall sound and I was dreading to listen the band with their new singer, Mike DiMeo (Riot). Another change in the lineup is Mike Terrana replacing Uli Kusch on the drums. So does these change alter Masterplan sound ? Yes and no. Yes because with Lande out of the band, Masterplan have somewhat reverted to the more colorful song-writing that could be found on the first album, and therefore the songs have found again the originality they had lost in Aeronautics (which to me was still a fantastic album, but maybe a little generic when compared to Masterplan's amazing debut album). No because on the drums, the replacement is a killer drummer, so you won't really feel any difference. Mike Teranna is one of the best drummers out there. Unfortunately that means that Rage lost a capital member of their golden trio, and that makes me a little sad. Now on to the vocals, Mike DiMeo is a worthy replacement to say the least. It actually took me many listens to realize that Jorn was gone. I of course knew he was, but Mike does such an amazing job and basically sings in the same range so the change is almost unnoticeable, that is except for the technical side of things, where Jorn was able to push the envelope a litte further. But all and all it feels like Masterplan didn't change their sound at all, and the songs from MK II are more in the vein of their debut (minus some heaviness and speed), which I'm sure the fans will appreciate. Aeronautics having been a little too Melodic Metal generic, still with great catchy choruses, some of which I'm not to forget any day soon. The guitar work is great as always, good heavy riffs, and great solos. Now the album has one flaw still, it has, in my opinion, too many power ballads and mid-tempos and not enough fast songs. Still, the fast paced song are killers, I just wish they would encompass a larger part of the album (at least more than 2-3 songs that is), and I wish there would be more songs like the catchy and fast paced Warriors Cry. Still, all songs are great songs with great hooks and atmosphere into them, and there are no boring moments in this album. But you gotta love mid-tempos that's for sure. The promo album only contained the first two songs full (Lost and Gone & Keeps Me Burning, which are both great songs) and the rest is fading and the first two songs are still in the mix (I don't see the point, since they were presented full, maybe to show what their order in the album is I guess). So that means the final album should have 12 tracks, one of which is an intro with some moments reminding me of the OST of the movie "The Rock". In the end, while on the mellow side, this is still a very solid effort and worthy third album for Masterplan, but its definitely not their best. I hope the new line-up wil stay stable and hopefully the next album will have a bit more punch and be a tad more heavy and fast songs. If you don't know Masterplan, you could easily get into them with this album, though their best effort (pretty much an instant classic if you ask me) to date still remains their debut album.